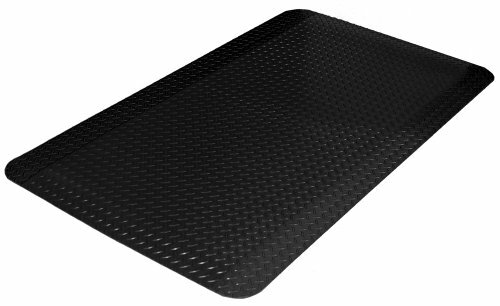 The Diamond Dek Sponge mat provides sure footing in a variety of applications. Beveled edges promote safety while the industrial grade foam reduces fatigue on legs and back. Heavy duty matting with diamond tread pattern provides sure footing in a variety of applications. Foam backing is resistant to many common oils, alkilydes and acids. Applications include: Commercial kitchen, garage, dry floor application, industrial/factory, retail/cashier and salon/barber and many more.